In Pokémon Go, Individual Values (IVs) are hidden stat modifiers that can range from 0 - 15. Each Pokémon has three IVs (Attack, Defense & Stamina). 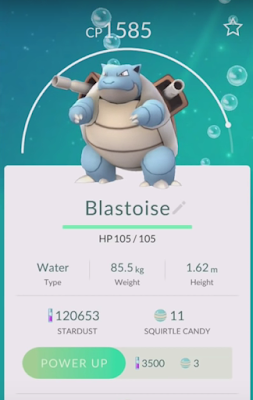 IVs are added to a Pokémon's base stats before calculating CP. This means that Pokémon of the same species with higher IV will have greater CP than those with lower IV. IVs are random and can vary among Pokémon of the same species. As you can see, IV can add up to about a 10% increase in Attack, Defense or Stamina (depending on the Pokémon's base stats). While IV does not have significant impact on a Pokémon's overall power, it does allow for slightly higher max CP. In addition, a Pokémon with perfect IVs will deal approximately 4% more damage. Some players focus on Powering Up their highest IV Pokémon, while others focus on Powering up their Pokémon with the highest DPS Moves. In a perfect world you will want to Power Up Pokémon with ideal movesets and perfect IVs. Note: Use the IV Calculator from Pokeassistant.com to determine the IV of your own individual Pokémon. I have a Vaporeon with near perfect IVs. 97.8% to be exact. so let me get this straight. There's no limit to 'Power Up'? A 10cp Eevee could catch up to a freshly caught 500cp Eevee? 1. There's no limit to 'Power Up'? 2. IVs are reset when evolving? You do realize that more than 20 million people play Pokemon go so 10,000 people isn't that much. No. the IV's are kept. And yes. All pokemon at a base will be the same, you could take a 10cp pokemon up into the thousands. it's mostly based on your level, to how high of a level you can bring your pokemon.